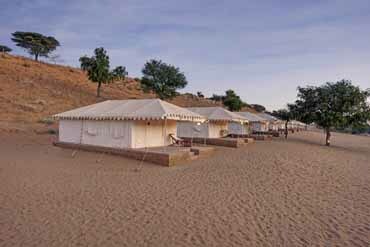 Hariyali Dhani Camps is one of the most beautiful Desert Camp in Rajasthan. 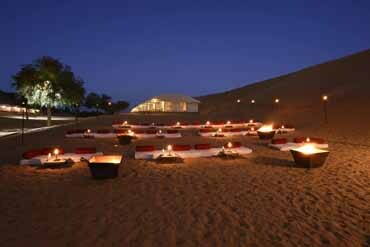 Located in the midst of the wilderness surrounded by the sand dunes. 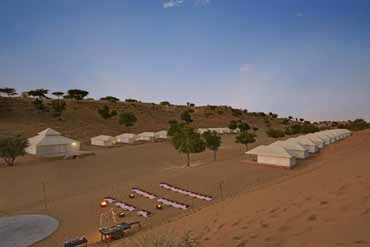 Each of these tents is carefully placed for commanding views over the desert wilderness. 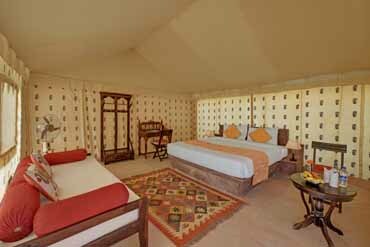 They are very luxurious with traditional camping- style furniture and lovely custom designed tents. 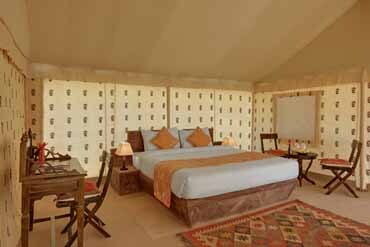 Beds are large, can be arranged as single, double or twins, and have electric lamps on side tables that illuminate the tents effectively at night. Large windows have pull up flaps to allow light and fresh desert air through and permanent insect netting to keep out any unwelcome visitors. The attached tiled bathrooms have 24 hours running hot and cold water, flush toilets and proper wash basins. 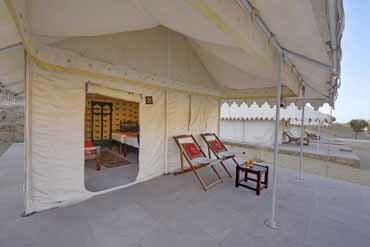 Each tent has two sit-outs in front of tent. 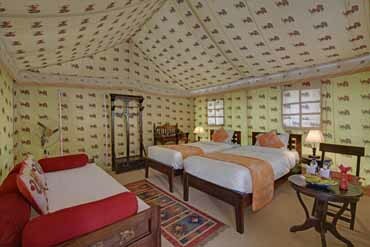 A comfortable is ensured in these deluxe tents and makes your stay filled of memories. If you are looking for some enthralling and fun-filled jeep safari experience, then this tour is a perfect fit for you. Embark on this desert jeep safari and glide over the dunes with elegance and pace. Enjoy the bumps and dumps in a 4x4 vehicle that will allow you to experience the great adventure of conquering the dunes. 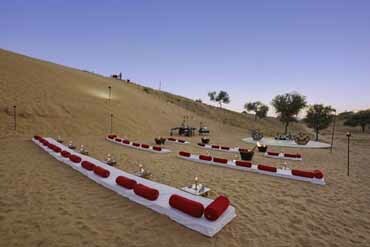 Desserts are the highlight of Rajasthan, and the best way to experience such beauty is via a camel safari. 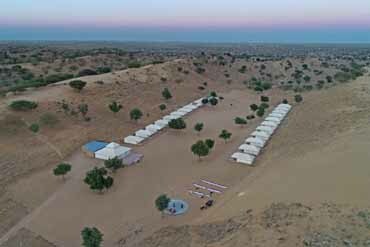 Camel safari is nothing less than thrilling, exciting and an altogether fabulous way to get a taste of the rural desert life — as well as immerse in the local culture. Here’s everything you need to know about it. The scent of mud, the beauty and the peace which is present in the village cannot be witnessed anywhere else. Rural culture and the simplicity of the people will touch your heart so deep that you will not forget for a lifetime. The entire village lives like one family, depending on each other for some work or another. Behold the beautiful sunset behind the golden sands of sand dunes. 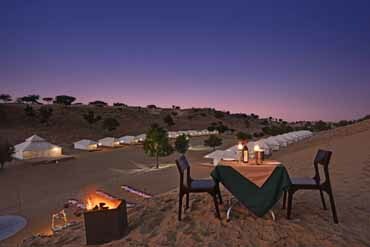 Proceed to the camp and enjoy a traditional welcome followed by the Rajasthani folk music and dance while you enjoy evening tea and delicious snacks. 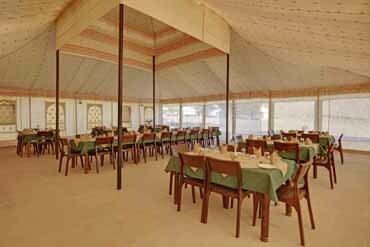 Have a delicious Rajasthani buffet near the camp fire with your loved ones. This is a amazing experience for everyone. Khichan Bird Sanctuary is located at a distance of 88 kms from Hariyali Dhani in the village of Khichan. This natural sanctuary serves as home to three types of birds called Kurjan, Karkara and Kunch that migrate from South West Europe. Birds they migrate to India during this time to avoid the cold winters of Europe. The Ossian Sachiya Mata temple is located at a distance of 75 kms from Hariyali Dhani in the village of Osian near Jodhpur was originally built in the 8th century. However, the temple complex that now stands dates back to the 12th century. The Sachiya Mata Osiyan Temple in Rajasthan is dedicated to Sachi Mata. Take a revitalizing swim in our lavish, well maintained and crystal clear, hygienically treated, open air swimming pool. It’s great for working up an appetite before dining or simply for relaxing on our poolside with a good book. Bathe in the cool water that offers a welcome respite from the scorching heart of Rajasthan. These days Wi-Fi is part of basic facility that provide by Hariyali Dhani. We provide the most bandwidth and the most robust and secure Wi-Fi. Guest can use Wi-Fi in Mobiles, Tablets & Laptops to get in touch with their respective relatives, friends, family and also touch in his business with his executives or clients. Online hotel reservations are a popular method for booking hotel rooms. Travelers can book rooms on a computer by using online security to protect their privacy and financial information. Hariyali Dhani offers special discount on online booking at our official website for early birds bookings. Travel Assistance for Hotel Guests. A guest should be able to plan their stay with the help of employees who are familiar with the area and all the tourist attractions and activities the place has to offer. 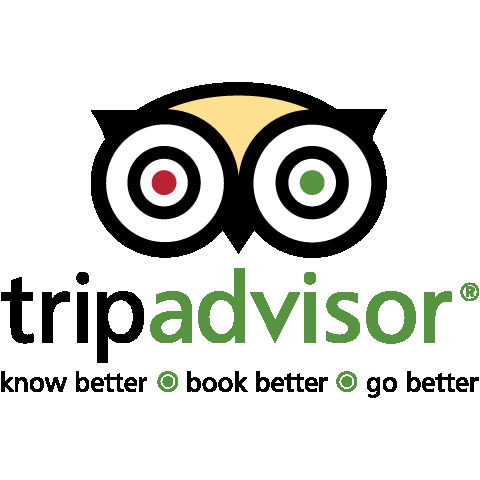 Experienced employees can assist guests with planning their itinerary from a travel desk. Pick up & Drop facility also available. Stayed in the tent camp for 4 days, and it wasn't one day too much... We stayed in tent number 23. We didn't miss a thing in the tent. 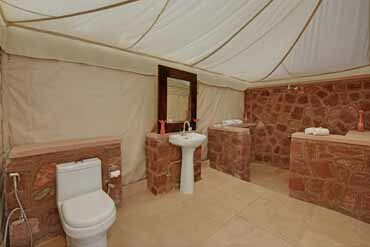 Spacious, clean, electricity, good beds, bathroom with hot water and a perfect terrace - but still the "tent feeling". The chef at this place is outstanding. Best food ever. Camel ride perfect. Camel cart ride perfect. All of the staff here were very, very helpful. I will never forget this experience. We spent one great, relaxing night here, and we loved it! We are a family of 4, so they moved 2 extra twin beds into our tent, and we still had plenty of room. The camel riding was so much fun and the cultural show was fantastic. The food was plentiful and never-ending! They provided extra blankets. The shower looked amazing, but the outside air was just too cold to enjoy it once you were out, so we didn’t attempt it.